A PC tailored to you and with an attractive price tag awaits you with the Equator PC-3100. You receive the suitable hardware for every application, since you completely configure the computer according to your requirements, using a modular design. The basic version supplies you with the main board, integrated power supply and a hard drive adapter. Easily select all additional components from the available accessories. We will take care of installation for you. With the Equator PC-3100 everything is possible, from the highly affordable basic PC to the high speed computer variant. This gives it particular versatility, and makes it universally usable. Depending on the amount of available space, its small housing may be either laid horizontally or stood up vertically to save even more space. With measurements of just 364 x 100 x 377 mm you integrate the PC-3100 easily into most working environments. Choose the necessary high speed processing performance from the Intel Core-i series processors. You choose between a Core i3 with 3.7 GHz, a Core i5 with 3.2 GHz and a Core i7 with 3.4 GHz. There is also a Pentium G4400 with 3.3 GHz available. Two to 32 GB DDR3 RAM, divided into two slots, give you the necessary speed, even for computing-intensive applications. The PC-3100 comes standard with a variety of interfaces for optimal expansion. An Ethernet port ensures for simple network integration. Additionally, a total of eight external USB ports are at your disposal, two of which are USB 3.0 ports located on the front, for easy access and quick data transfer. There is also a PS/2 keyboard connection, a DVI and VGA port. Inside you have access to three PCIe connections each, as well as four SATA slots. You may also expand the interfaces as required receive the PC-3100 with an RS232 port and Wi-Fi. The available DVD drive gives you even more leeway when installing drivers and software. You also have your choice of memory media. Whether 2.5/3.5 SATA HDD or 2.5 SSD - you select the size according to your needs. 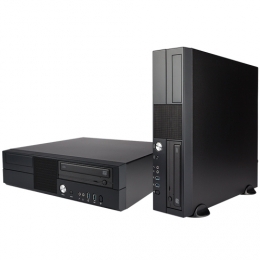 The Equator PC-3100 is optimal for usage with Windows 7, 8 and 10. Upon request you receive the PC with a pre-installed operating system. The components offered here are consumer hardware. Therefore, the components are subject to the resulting life cycles and market prices. If you require POS hardware certified for 24-hour operation, and with a spare parts warranty, Retail EPoS Systems also has special industrial PCs available for you. Dual RS232 interface - 2x RS232 interface, 9 pin. male, fits for Equator PC-3100, max. 2pcs. per system. Intel Core i5 CPU - Intel Core i5-4440 CPU, 3.1GHz, incl. fan. Fits for Equator PC-3100. dual RS232 Interface, expension - RS232 interface, 2x RS232 9 pin. male, PCI, fits for Equator PC-3100, max. 2pcs. per system. RS232 interface - RS232 interface, 9 pin. male, fits for Equator PC-3100, max. 1pcs. per system. LPT interface - LPT interface, 25pin female, fits for Equator PC-3100, max. 1x per system. Intel Core i3 CPU - Intel Core i3-4130 CPU, 3,4GHz, incl. fan. Fits for Equator PC-3100. Intel Core i7 CPU - Intel Core i7-4770 CPU, 3,4GHz, incl. fan. Fits for Equator PC-3100. Intel Core i5 CPU - Intel Core i5-4430 CPU, 3.0GHz, incl. fan. Fits for Equator PC-3100.